Stokke® Carry Cot, designed for use with the Xplory® stroller (sold separately). Includes lining, mattress, wind/rain cover, and seat with textiles. Height adjustable: brings the baby closer to mom and dad. Carry handles fastened to the sturdy plastic provide a very safe solution when carrying the Cot. Designed to be used from birth to 20 lbs. Materials: Polyester textile; cot shell, automotive-grade polymer. Please note: Canopy comes with the Xplory® stroller, not included with the cot. 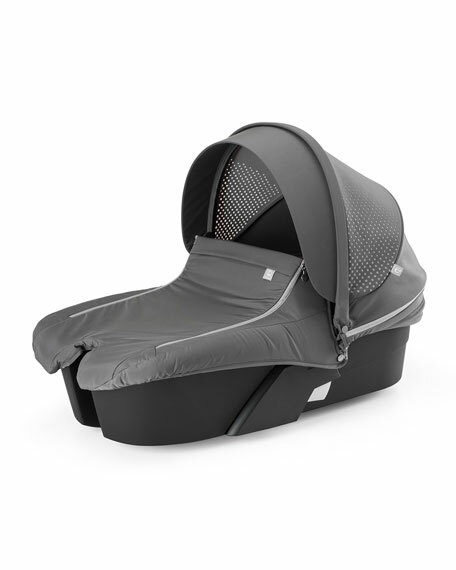 Hood for Stokke® Xplory® carry cot is not included. It can be purchased separately or if you have the Stokke® Xplory® with seat, the hood is interchangeable. For in-store inquiries, use sku #2488834.